The long-fill is a period of time long enough tu permit changes in the variable as well as in the fixed factors. In the long run, accordingly, all fat. :tor~ arc variable and none fixed. Thus, in the lung-run, firms can change their output by increasing their fixed equipment. They can enlarge the old plants or replace them by new plants or add new plants. Moreover, in the long-rm, new firms can also enter the industry. On the contrary. if the situation ~ll dcnu ls in the long- ITn, finns can diminish their fixed cquipmcuts by allowing them to wear out without replacement and the existing finns can leave the industry. Thus, the long-run equilibrium will refer to a situation where free and full scope for adjustment has been allowed to economic forces. In the long-run. 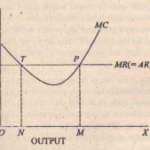 it is the long-run average and marginal cost CURVES which arc _ relevant for making output decisions. 1-urther. in the long-n n, average variable cost is of no particular relevance. It is the average total cost which is of determining importance, since in the long-rrn all costs arc variable and none fixed. losses. Some of the existing firms will quit the industry. As a result, the output of the industry will decrease and the price will rise to equal the average cost so that the firms remaining in the industry are making normal profits. Hence. in the long-rrn, firms need not be forced to produce at a loss since they can leave the industry, if they arc having losses. 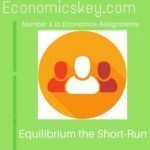 Thus, for a perfectly competitive firm to be in equilibrium in the long-rrn, the following two conditions must be satisfied.